This page continues part 1 on Instruction, providing Instruction Resources, including for special needs students (e.g., deaf, visually impaired, learning disabilities, English language learners). Help your students understand what the Common Core Standards of Mathematical Practices mean to them. Jordan School District in Utah has made available colorful Common Core math posters that visually describe each mathematical practice with pictures, words, and examples. Within each of the eight standards are posters applicable to grade bands K-1, 2-3, 4-5, and 6. Display these in your classroom. Where To Focus: Math Shifts, Key Fluencies, and Major Work of Grade is of particular relevance for K-8 mathematics as it provides guidance for focusing instruction at each grade level for implementing the Common Core State Standards in Mathematics. Content emphases are identified by major clusters, supporting clusters, and additional clusters. The mathematics section includes Common Core exemplar tasks and assessments with explanations and supporting resources, and Common Core aligned exemplar lessons and units with supporting resources. There are also tools for planning, additional materials for understanding the math, and ready-to-use modules for professional development. The Aligned Instructional Practice Suite (AIP) "includes coaching and lesson planning tools to help teachers and those who support teachers to make the Key Shifts in instructional practice required by the Common Core State Standards" (AIP description, para. 1). EduCore from ASCD is a free resource for "professional development, lesson plans and modules, and other materials—that you will need to successfully implement the Common Core State Standards for Mathematics and Literacy." The Math Tools section "features formative assessment lessons and instructional videos for mathematics aligned to the Common Core." Classroom challenges (formative assessment lessons developed by the Mathematics Assessment Project) are provided for middle and high school, concept development, problem solving, and include supplemental and related resources. ASCD's Common Core Resource Collections on iTunes include math for each K-8 grade, Algebra 1, Algebra 2, and Geometry. Each collection is intended to give you lesson and activity ideas; suggested books, apps, and web content; instructional content and assessment information; and sample assessment items from PARCC and SBAC to help meet the goals of the CCSS. Most math resources within each collection are free. Inside Mathematics, which grew out of the Noyce Foundation's Silicon Valley Mathematics Initiative, is exemplary as "a professional resource for educators passionate about improving students' mathematics learning and performance. This site features classroom examples of innovative teaching methods and insights into student learning, tools for mathematics instruction [organized by grade level and subject] that teachers can use immediately, and video tours of the ideas and materials on the site" (Welcome section). The Ohio Department of Education developed a Correlation of Inside Mathematics Tasks to CCSS (Common Core State Standards) as of June 2010. PowerUp WHAT WORKS provides "customizable resources for teachers, school leaders, PD facilitators, and teacher educators to improve teaching and learning for struggling students and those with disabilities." You'll find "teaching strategies supported by technology, technology use in schools and classrooms, Universal Design for Learning (UDL) and differentiated instruction, [and] guidance on meeting Common Core Standards" (About Us section). The Resource Library contains numerous articles on math teaching strategies. Teaching Channel offers free videos "on the Internet and TV—of inspiring and effective teaching practices in America's schools." Further, the "video library offers educators a wide range of subjects for grades K-12. The videos also include information on alignment with Common Core State Standards and ancillary material for teachers to use in their own classrooms" (About Us section). Focus on students’ mathematical reasoning, not accuracy in using language. Shift to a focus on mathematical discourse practices, move away from simplified views of language. Recognize and support students to engage with the complexity of language in math classrooms. Treat everyday language and experiences as resources, not as obstacles. In Teaching Fractions According to the Common Core Standards, Wu (2014) presents an expanded view on how CCSS fraction standards may be taught in grades 3-7. Discussion at each grade level begins with the fraction standard. "As of 2014, it may be unique in that it is written for the classroom teachers by someone who has been teaching fractions to elementary and middle school teachers since year 2000 in a way that is in almost complete agreement with the Common Core Standards" (Preface section). In Teaching Geometry According to the Common Core Standards, Wu (2013) presents grade-by-grade commentaries on teaching the geometry standards for grades 4-8 and high school. He emphasizes the progression of the mathematical ideas through the grades. The companion article to this is Teaching Geometry in Grade 8 and High School According to the Common Core Standards. Teaching Calculus by Lin McMullin is a blog for high school teachers and students, especially Advanced Placement Calculus teachers and students. You'll find comments, suggestions, hints, and observations on the topics for the course, and a video collection. Of particular value is the section called "Thru the Year," which includes topics in an order that they typically taught month-by-month. Use solved problems to engage students in analyzing algebraic reasoning and strategies. Teach students to utilize the structure of algebraic representations. A palindrome, which is a number that can be read the same in both directions, can be generated from any number by making successive additions of the number with its reversal (p. 27). This might take a few such additions. 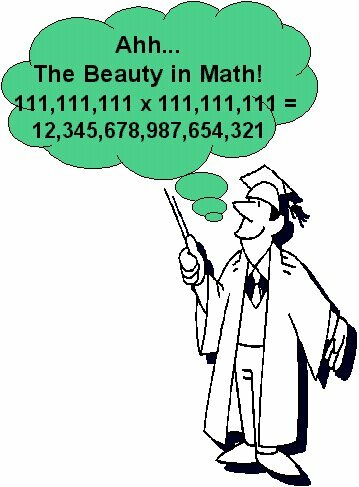 There are only five numbers (i.e., 1, 153, 370, 371, and 407) in which the number is the sum of the cubes of its digits as in 153 = 13+53+33 (p. 36). Adding It Up: Helping Children Learn Mathematics (2001) is a longer book (over 400 pages), available online, by the Mathematics Learning Study Committee and editors Jeremy Kilpatrick, Jane Swafford, and Bradford Findell of the Center for Education at the National Research Council. Its focus is school mathematics from pre-kindergarten to eighth grade. Much of this report attends to the learning and teaching of number, but authors emphasize that their perspective is considerably broader than just computation. Authors say, "Three kinds of knowledge are crucial for teaching school mathematics: knowledge of mathematics, knowledge of students, and knowledge of instructional practices" (p. 370). Adolescent Literacy in the Content Areas posted at Brown University contains a section devoted to Supporting the Math Classroom through Literacy Development, originally posted at the Knowledge Loom web site. Note: the Knowledge Loom was archived in 2013. Strategies that support literacy development and understanding of math concepts include "Think Alouds, graphic organizers, word problems, brainteasers, math journals, Inquiry Models, Quick Writes, Word Walls, concept maps, flow charts, computer or graphic programming, creation of texts, Socratic Questioning, and WebQuests" (p. 174). Algebra 4 All (A4A) Social Network is a "community of educators committed to sharing resources and supporting one another in the practice of teaching Algebra." A4A is sponsored by the Michigan Learnport. You'll find a group discussion forum, a project and lesson sharing area, blog posts, videos on multiple topics, an extensive collection of resources organized by function families, and more. The Art of Teaching Resources from TeacherVision.com. Reinforcing effort and providing recognition--you might have students keep a weekly log of efforts and achievements with periodic reflections of those. They might even mathematically analyze their data. Find ways to personalize recognition, such as giving individualized awards for accomplishments. Cooperative learning--consider common experiences or interests; vary group sizes and objectives. Core components include positive interdependence, group processing, appropriate use of social skills, face-to-face interaction, and individual and group accountability. Generating and testing hypotheses--a deductive (e.g. predict what might happen if ...) , rather than an inductive, approach works best. Cues, questions, and advance organizers--these should be highly analytical, should focus on what is important, and are most effective when used before a learning experience. The authors caution, however, that instructional strategies are only tools and "they should not be expected to work equally well in all situations." Concrete and Virtual Manipulatives Research: The George Mason University Mathematics Education Center focuses on the study of concrete and virtual manipulatives. You will find a list of published articles and abstracts on this topic. The Critical Thinking Community comprises The Center for Critical Thinking and Moral Critique and the Foundation For Critical Thinking. "The work of the Foundation is to integrate the Center’s research and theoretical developments, and to create events and resources designed to help educators improve their instruction" (Mission). Resources are numerous at this site, particularly articles that define critical thinking and elaborate on the dimensions of critical thought. See Sample Teaching Strategies for K-12 Teachers and For Students, for example. Articles are relevant for teaching critical thinking within the mathematics classroom. Digital Promise Research Map: Math Learning includes over 1500 research articles on teaching and learning math. Per the description: "The Math Learning topic includes research on how the brain develops the ability to understand and do math. Studies in this topic also explore math learning differences and the effects of math interventions." There are eight additional focused subtopics of interest, including math learning disabilities and math interventions. Everyday Mathematics algorithms for grades 2-6 and their animations from McGraw-Hill Education are among the free resources and are also good for family use. Get Ready to Read: Early Math from the National Center for Learning Disabilities. This section has tips for teachers of preschool math, including for building an effective preschool math program, tips for screening for math awareness and skills in early learners, activities to help preschoolers gain math literacy, tips for partnering with parents, and more. Helping Children Learn Mathematics (2002) is a short book (52 pages), available online, by the Mathematics Learning Study Committee and editors J. Kilpatrick and J. Swafford of the Center for Education at the National Research Council. The authors stress that mathematics proficiency involves five intertwined strands: understanding mathematics, computing fluency, applying concepts to solve problems, reasoning logically, and engaging with mathematics, seeing it as sensible, useful, and doable. Mathematics in grades K-8 should be taught for an hour a day. Time should be divided so that all of the strands receive adequate attention--the key being that instructional materials should integrate the five strands. All students can and should be proficient in mathematics. Houghton Mifflin Math Education Place has teaching models and tools (glossary, online manipulatives, graphic organizers, games) associated with each of the chapters in their K-6 texts to help you teach concepts--excellent resource for methodology. Instructional Methods Information by Dr. Bob Kizlik includes advantages, disadvantages, and required preparation related to using direct teaching, cooperative learning, lecture, lecture with discussion, a panel of experts, brainstorming, video tapes/slides, discussion, small group discussion, role playing, worksheets/surveys, guest speakers, and values clarification. Kindergarten-lessons.com provides information for parents who home school, early childhood or primary educators, education students, beginning teachers, seasoned teachers changing grade, and parents wondering what their children should be learning in school. General tips for teaching and how to teach math, science, social studies, with themes, art, and ideas for holidays are provided. Knowing and Teaching Elementary Mathematics (2010) by Liping Ma is the anniversary edition of his book, which was first published in 1999. It includes examples from teachers explaining what it means to know and be able to teach elementary school mathematics. Richard Askey explained the relevance of this book in an article by the same name in the Fall 1999 edition of American Educator. You'll be introduced to typical scenarios in the classroom, such as teaching subtraction and regrouping, multi-digit multiplication, division by fractions, and the relationship between area and perimeter. a number of classroom resources. The math concept maps in Curriculum Planning are superb with examples of the key concepts for each of the five math content areas. When you click on the bolded concepts, you will see a definition and, in some cases, examples. Mathematics Education: The Math Forum at NCTM contains information on numerous topics related to teacher education and professional development, research in math education, organizations, journals, conferences with math education components, technology in math education (e.g., calculators, computers, software), new directions and issues in pedagogy (e.g., adult numeracy, assessment, calculus reform, collaborative learning, constructivism, curriculum development, math education reform, NCTM standards). Read about teaching issues/strategies and technology in math education. The Most Common Errors in Undergraduate Mathematics have been articulated by E. Schechter of Vanderbilt University's Math Department, along with the likely causes of those errors, and their remedies. Dr. Schechter presents errors in communication, algebra errors, confusion with notation, errors in reasoning, unwarranted generalizations, and common calculus errors. Any teacher of upper level secondary mathematics will also benefit from this presentation, which should be shared with students--they make the mistakes after all. Pointing out these common errors as part of your teaching methodology might help students to become more successful in learning algebra and calculus. Mathwire.com has a section on instructional strategies addressing active participation, cooperative learning, assessment, classroom management, and differentiation. Northwest Regional Educational Laboratory Math Problem Solving Model "helps educators meet the challenges of teaching and assessing open-ended problem solving. The model includes a scoring guide for problem solving, open-ended tasks, and examples of student work for practice in scoring." The design of the model was informed by Robert McIntosh and Denise Jarrett's (2000) TEACHING MATHEMATICAL PROBLEM SOLVING: IMPLEMENTING THE VISION, which is a review of recent research and literature on the essential traits and processes of teaching and learning mathematics through open-ended problem solving. National Numeracy Network: Teaching Resources from the Science Education Resource Center at Carleton College include multiple resources for teaching quantitative reasoning at the secondary and post-secondary levels. For example, seven pedagogical methods are provided(e.g., teaching quantitative reasoning with the news, teaching with data, teaching with models, teaching with spreadsheets across the curriculum). Pedagogy in Action from the Science Education Resource Center at Carleton College includes a library of pedagogic methods and related activities exemplifying each method. You can begin by exploring sections on Engaged Pedagogies, Teaching with Data, Quantitative Reasoning, and Assessment. Promoting Reading Strategies for Developmental Mathematics Textbooks by Anne E. Campbell, Ann Schlumberger, and Lou Ann Pate of Pima Community College presents three reading and study strategies designed to facilitate student comprehension of and learning from developmental mathematics textbooks. The discussion includes a preview, predict, read, and review reading strategy; concept cards; and a Question Answer Relationship technique. For example, concepts cards can include definitions, characteristics, examples, and nonexamples. Common kinds of concept cards in math include: (a) strategy cards for solving problems; (b) fact cards that include rules, laws, or theorems; and (c) cards for symbols and specialized vocabulary. Teachersnetwork.org has a series of articles on how to teach math. Among resources are lesson plans, podcasts, and curriculum units for elementary, middle, and high school math. "The Concept and Teaching of Place-Value"
"The Socratic Method: Teaching by Asking Instead of by Telling"
"A Supplemental Introduction to Algebra" and a separate webpage "The Way Algebra Works"
The Problem with Math Is English by Concepcion Molina (2012) is "A Language-Focused Approach to Helping All Students Develop a Deeper Understanding of Mathematics. " All math teachers, particularly those who teach grades 3-9, will benefit as Molina delves into the language and symbolism of mathematics and the importance of integrating English language comprehension lessons into math instruction. He provides tips for doing so. All students, including English language learners, benefit from explicit language instruction integrated into the math curriculum. The focus is on building conceptual understanding of key concepts "primarily in the algebra and number and operation strands of the mathematics content standards. At the same time, the text explores the relationships between and connections among key mathematical topics to illustrate how a basic understanding of more complex concepts can be developed while teaching fundamental ideas" (p. xvii) . An Introduction to Teaching Mathematics at the College Level (pdf) by Suzanne Kelton (Assumption College) is intended primarily for those new to teaching math at the college level. The subject-matter content relates to teaching algebra, precalculus and calculus with excellent tips for introducing concepts. As those subjects are also in the high-school curriculum, this guide should prove helpful for high school teachers. Do you need some quick facts about learning disabilities? Prominent learning disabilities among school-age children include dyscalculia, dysgraphia, dyspraxia, dyslexia, ADHD, and Gerstmann's Syndrome. You can learn more about these and their symptoms, possible causes, and common issues from the Learning Disabilities Infographic posted at special-education-degree.net. Assistive Technology: an Overview is a five-part module from Vanderbilt University, which provides classroom teachers with information and videos on working with students with disabilities. In addition to providing the basics, it "explores ways to expand students' access to [assistive technology] in the classroom." The Family Educational Rights and Privacy Act (FERPA) (20 U.S.C. § 1232g; 34 CFR Part 99) is "a Federal law that protects the privacy of student education records. The law applies to all schools that receive funds under an applicable program of the U.S. Department of Education. FERPA gives parents certain rights with respect to their children's education records. These rights transfer to the student when he or she reaches the age of 18 or attends a school beyond the high school level" (FERPA web site description). Section 504 and the Education of Children with Disabilities Frequently Asked Questions outlines some key facts you should know about. Center on Instruction: Mathematics offers materials and resources "to build educators’ knowledge of instruction for students with low achievement in mathematics, improve professional development models for math teachers, and build teachers’ skills in monitoring student growth toward important math outcomes." The Center on Instruction maintains a collection of scientifically based research for reading, math, science, special education and English language learners, and exemplars of best practice. It is one of five content centers serving as resources for the 16 regional U.S. Department of Education Comprehensive Centers. "The Math Learning Difficulties subtopic explores research on the relationship between cognitive factors – such as working memory, processing speed and executive function – and math learning differences." "The Math Interventions subtopic includes research and evaluations on various interventions to improve children’s math skills. There is a particular focus on students with math learning difficulties." Dyscalculia.org addresses teaching and learning strategies for learners with dyscalculia (math LDs) and dyslexia (reading LDs). A diagnostic is available (fee attached), along with special education resources. Learners with dyscalculia might benefit from a special talking calculator called the Dyscalculator. It is designed to assist with arithmetic by offering four different representations of quantities: as digits, as words, graphically, and spoken aloud. It can also round numbers. This free app is designed for iPad, iPhone. Also see Dyscalculator for Android. Education for All: The Report of the Expert Panel on Literacy and Numeracy Instruction for Students With Special Education Needs, Kindergarten to Grade 6 (2005) was financially supported by the Ontario Ministry of Education in Canada (See http://www.edu.gov.on.ca/eng/policyfunding/reports.html#2005). The report recommends practices, based on research, "to improve and reinforce effective instruction of reading, writing, oral communication, and mathematics to students from Kindergarten to Grade 6 who have special education needs" (p. 1). However, practices discussed can enhance the learning of all students in mathematics and literacy. Chapters address Universal Design and Differentiated Instruction, Assessment and Evaluation, Developing Learning Profiles, Professional Learning Communities, Research to Practice: What Works for Both Literacy and Numeracy; Effective Instructional Approaches for Numeracy, Effective Instructional Approaches for Literacy, Organization and Management, Computer-based Assistive Technology, and Professional Development. Accessibility Strategies to Consider: Strategies to consider when planning and teaching accessible lessons (1 page). Guiding Questions for Accessibility Strategies: Guiding questions for planning, implementing, and evaluating strategies (1 page). Accessibility Tool List: Strategies that teachers can use to make mathematics more accessible to students with disabilities. (9 pages). Learning Disabilities Online contains a series of articles with strategies for teaching mathematics to students with learning disabilities, but those strategies are suitable for use with all students. Read how to modify mathematics instruction to promote success and understanding in the areas of mathematical readiness, computation, and problem-solving; how use cooperative learning in the math classroom, and how to break math difficulties down into different types. Another article discusses techniques that have been demonstrated to be effective with secondary students who have learning disabilities in mathematics. Learning Toolbox from the James Madison University Special Education Program contains tools and resources to enable students with learning difficulties to become better learners. Sections are devoted to secondary learners, teachers of middle and secondary students, and parents. Academic areas and strategies include organization, test taking, study skills, notetaking, reading, writing, math, and advanced thinking. Advanced thinking addresses organizing information sequentially, comparing and contrasting ideas, understanding categories, determining cause and effect relationships, and problem solving. Mathematics Education: The Math Forum at NCTM also contains math resources for people with disabilities. MathPlayer by Design Science contains math-to-speech technology. Per the User Manual: "MathPlayer can make documents more accessible by providing a means for assistive technology such as screen readers and screen magnifiers to speak, navigate, and convert to braille math in those documents. As an example MathPlayer works with NV Access' NonVisual Desktop (NVDA) to provide access to the math in Firefox, Internet Explorer, Word and PowerPoint for Windows (MathType is also required to read math in Word and PowerPoint). MathPlayer can also work with Internet Explorer in Enterprise Mode to display the math in web pages." There is a free download. MathTalk.com is speech recognition software for mathematics from Metroplex Voice Computing. It enables math to be done without keyboard or mouse. Use it for voice arithmetic /pre-algebra /algebra /trig /calculus /statistics/graphing & more. It includes Scientific Notebook; users can choose to translate math to Braille in Duxbury Braille Translator. Demos are available. Math VIDS! "MathVIDS is an interactive website for teachers who are teaching math to students who are having difficulty learning mathematics. The development of MathVIDS was sponsored through funding by the Virginia Department of Education" (sec: Introduction). 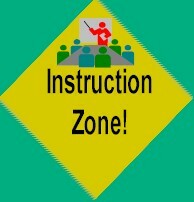 The site contains Foundational Information, Instructional Strategies, and Teaching Plans. Foundational Information is devoted to Math Disabilities and Metacognitive Strategies. The Instructional Strategies section describes and models fifteen, research-based effective math instructional strategies for students with learning difficulties. The Teaching Plans section provides detailed instructional plans and selected video models for teaching specific K-5 math concepts/SOL. National Center on Accessible Instructional Materials: Learn about accessible media, how to create it, policy, and practice. 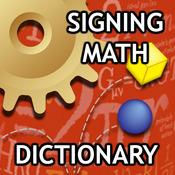 Signing Math Dictionary (SMD) is a math app by Vcom3D, compatible with iPhone, iPad, and iPod Touch. It is described as "an illustrated, interactive 3D sign language dictionary with 705 math terms defined in both American Sign Language (ASL) and Signed English (SE). The SMD is one in a series of fully animated, illustrated and interactive 3D signing dictionaries. The SMD is designed for grade 4-8 students who are Deaf or Hard-of-Hearing and use ASL or SE in the classroom. The SMD supports access to standards-based math content among elementary and middle school students" (Description section). While not free (about $15), it would also be a valuable tool for teachers and parents. Special Connections, according to the Web site, "is a Project of National Significance (CFDA #84.325N) funded through the federal Office of Special Education Programs (OSEP) and coordinated through the University of Kansas. The ultimate goal of the project is to provide educators, both classroom teachers and university faculty, with tools and resources that support students with special needs in general education settings and in accessing the general education curriculum in meaningful ways. Four main areas of focus include Instruction, Assessment, Behavior Plans, and Collaboration." Tools for mathematics address building initial mathematical understanding, extending that understanding, building proficiency through games, evaluating student needs and making effective mathematics instructional decisions. Supporting ELLS in Mathematics from Stanford University includes highly recommended teaching resources related to the Common Core, including principles for instruction, guidelines for math instructional materials development, and "language of math" task templates (e.g., to support reading math problems, and to support math vocabulary for communication). Teaching Math to Visually Impaired Students: S. Osterhaus of the Texas School for the Blind and Visually Impaired offers strategies and resources for teaching mathematics to visually impaired students. She provides links to math education and Nemeth code, tactile math graphics, calculators, current research in math for VI students and more. Teaching Tips for Children and Adults with Autism by Dr. Temple Grandin (2002) includes tips and strategies that will help educators establish conditions in the classroom most conducive to helping those with autism to succeed. Although not specifically about math, tips include methods teachers can apply for learning math and for how students with autism can best express their understanding. TIPS for English Language Learners in Mathematics (2005) from the Ontario (CA) Ministry of Education includes grade-level support materials for those working with English language learners in Grades 7 to 10. "This resource contains models for adjustment of instruction for pairs, small groups, or the entire class and ways of differentiating instruction and assessment for English language learners so they can achieve literacy and mathematics goals. These adjustments in student groupings, teaching strategies, timing, and materials are based on recent research of ways to support English language learners" (Introduction, p. 1). HOT: TTAC Online: Instructional Strategies are intended to help youth with disabilities from birth to 22. Strategies are organized by type of disability within content areas: English, Mathematics, History/Social Science. "TTAC Online was originally produced by George Mason University professors and students in the Graduate School of Education, Instructional Technology Program" (About Us section). Committee for Children addresses programs for prevention of bullying and violence, and includes a personal safety curriculum. Digital Promise Research Map: Identity, Behavior, and Relationships includes over 6900 research articles on this topic. Per the description: "The Identity, Behavior, and Relationships topic includes research on the development of social and emotional skills including emotional regulation; gender, race, and ethnic identities; and relationship building. This topic also explores considerations and policies for the design of learning environments and interactions in support of behavioral and academic outcomes, particularly for early learners." You Can Handle Them All, a Web site on discipline help for teachers and parents, lists over 100 behaviors (e.g., arrogant, class clown, cheater, disorganized, overly aggressive, whiner), the affect of each, actions to take to change the behavior, and mistakes in dealing with the behavior. As you strive to learn methods for presenting math concepts to students, don't neglect your need to connect math to your learners' everyday lives. Consider Scholastic MATH, an award-winning math magazine with 10 issues each year designed specifically for middle school and early high school students. Each issue also includes articles on real-world uses of math and how math is used in various careers. Do you have a question about teaching mathematics? The Mathematics Educators Stack Exchange "is a question and answer site for those involved in the field of teaching mathematics. It's built and run by you as part of the Stack Exchange network of Q&A sites." With your help, the site "is working together to build a library of detailed answers to every question about teaching mathematics." The site is totally free and no registration is required. Anyone can ask a question, anyone can answer, and the best answers are voted up and rise to the top. Need books or articles on Math Methodology? Association for Childhood Education International Among publications of interest is the book: Mathematics for All: Instructional Strategies To Assist Students With Learning Challenges, Editors: Nancy L. Gallenstein and Dodi Hodges, 2011. ERIC (Education Resources Information Center) is sponsored by the U.S. Department of Education, Institute of Education Sciences. ERIC's search can be restricted to peer-reviewed only or full text articles. Search by descriptors such as mathematics instruction, mathematics achievement, mathematics education, academic achievement, teaching methods, program effectiveness, and more. You can search by source, author, publication date, publication type, education level, and audience. There is a Thesaurus that has multiple subcategories and related mathematical terms. ERIC offers an extensive collection for journal articles, books, research syntheses, conference papers, technical reports, policy papers, and other education-related materials. Note: Your might be interested in a history of ERIC: 50 Years of ERIC: 1964-2014.
isbn.nu has mathematics books at all levels. Use search phrases such as mathematics study teaching secondary or mathematics study teaching elementary. This site will then link you to a resource for purchasing the book. National Academies Press: http://www.nap.edu/topics.php?browse=1 has over 4,000 books online, which you can read for free. For example, math educators might be interested in How Students Learn: History, Mathematics, and Science in the Classroom (2005) by Committee on How People Learn, A Targeted Report for Teachers, Center for Studies on Behavior and Development, National Research Council. National Council of Teachers of Mathematics: Educators might be particularly interested in the following books. Implementing the Common Core State Standards through Mathematical Problem Solving is a series of books available by grade bands: K-2, 3-5, 6-8, and high school. Principles to Actions: Ensuring Mathematical Success for All (2014) addresses "What it will take to turn the opportunity of the Common Core into reality in every classroom, school, and district." You'll find "a research-based description of eight essential Mathematics Teaching Practices" and more. Questia.com: http://www.questia.com/ promotes itself as the world's largest online library. Search using phrases like: teaching mathematics.